In the morning, if you still have not woke up by the sound of dissatisfied dogs barking away to pass time, or the ever-repeated Für Elise jingle of Sri Lanka’s mobile bakery trucks, there will no doubt be a morning puja in a temple nearby to provide that service for you. 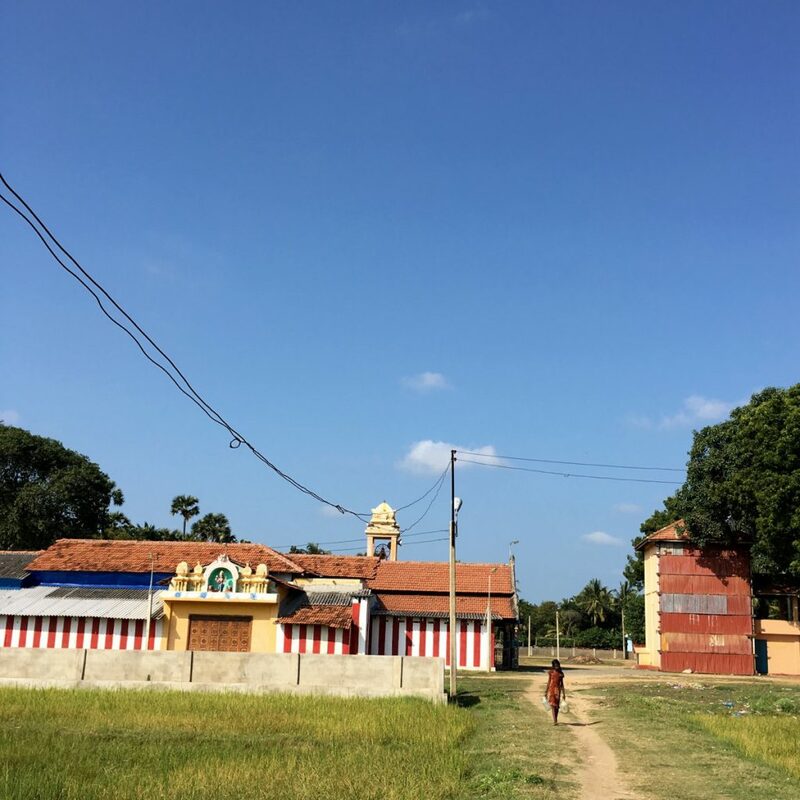 Because wherever you are in Jaffna or other Tamil-majority areas in northern and north-eastern Sri Lanka, the distance to the nearest temple is never far. 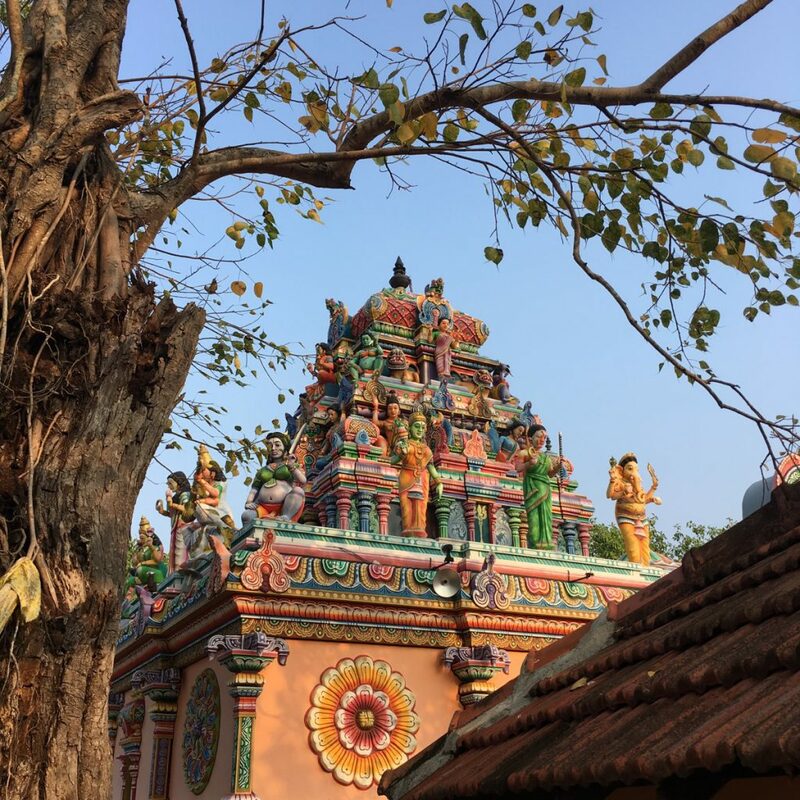 “Temple” – or kovil, as it translates in Tamil – can refer to a number of different kinds of holy structures, from the tiniest roadside altar to grand and massive complexes that make up entire neighbourhoods of their own. 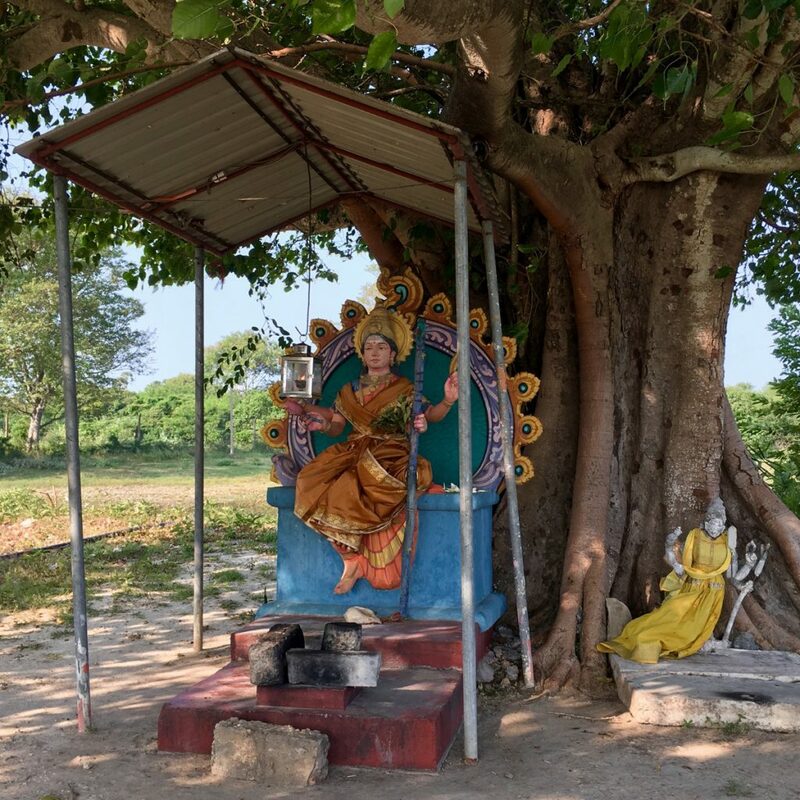 Since Hinduism, the religion with most followers among Sri Lanka’s Tamils, embraces so many deities and holy avatars, there is always a reason to construct even the tiniest temple paying tribute to any of them. 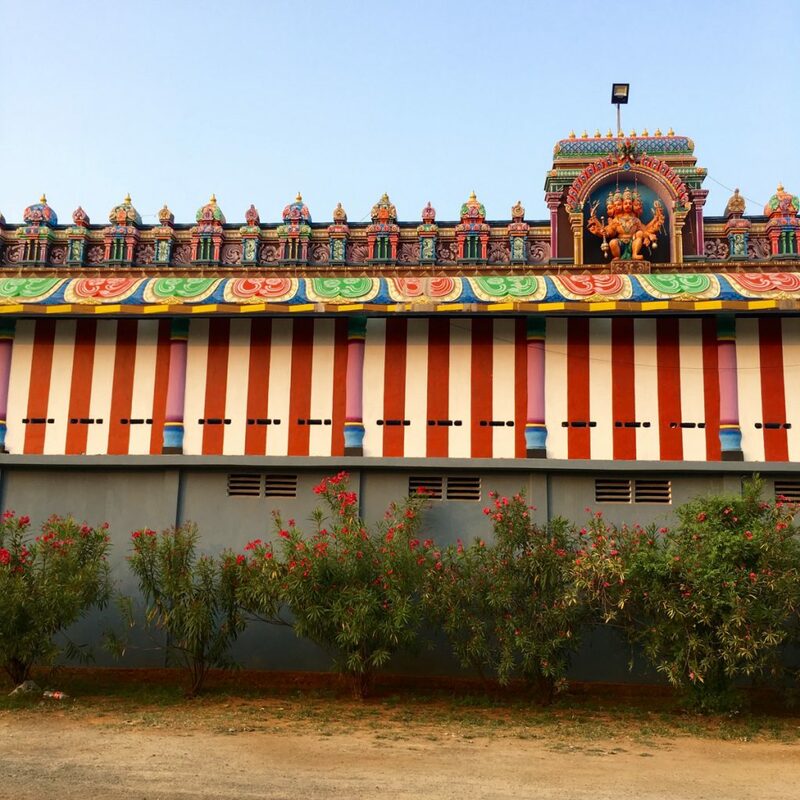 The exterior of the Hanuman temple south of Chunnakam, just outside Jaffna city. Now, as in all traditions and all places, what we call “religion” and “culture” are not so easily separated. They often overlap and tie into each other, creating this complex and ever-evolving place we know as society. Temples, indeed all holy spaces, are more than religious manifestations; they embody historical pasts and changing presents. Kovils may be seen as firstly be the abodes of holy figures, but are at the same time open-air artistic and imaginative galleries, displaying collective dreams and aspirations. Actually, that role – of displaying aesthetics, surprise and beauty – shall not be underestimated. 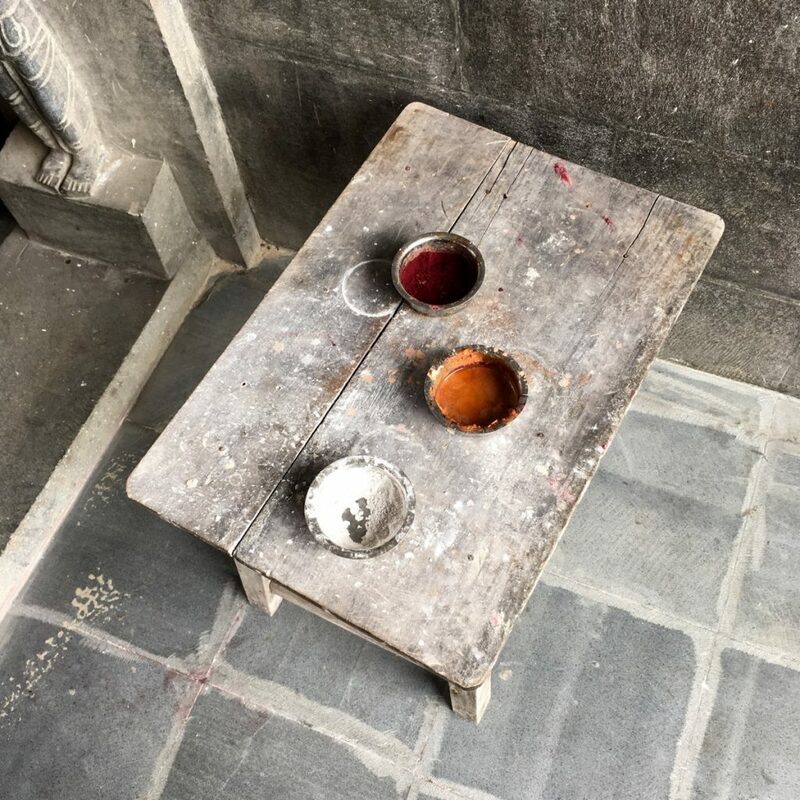 Sites of worship, when erected in a city, town or village, become part of its shared communal space, and therefore something that belongs to everyone. In that sense, the temples are part of making up not only religious Sri Lanka but also social and cultural Sri Lanka. The Sri Lankan Tamil people, if we look far enough back in history, trace their roots to southern India (the Sinhalese, who form the numerical majority on the island, are ancestors of northern Indians; the Sinhalese language is a sibling to Hindi and other Indo-Aryan languages). 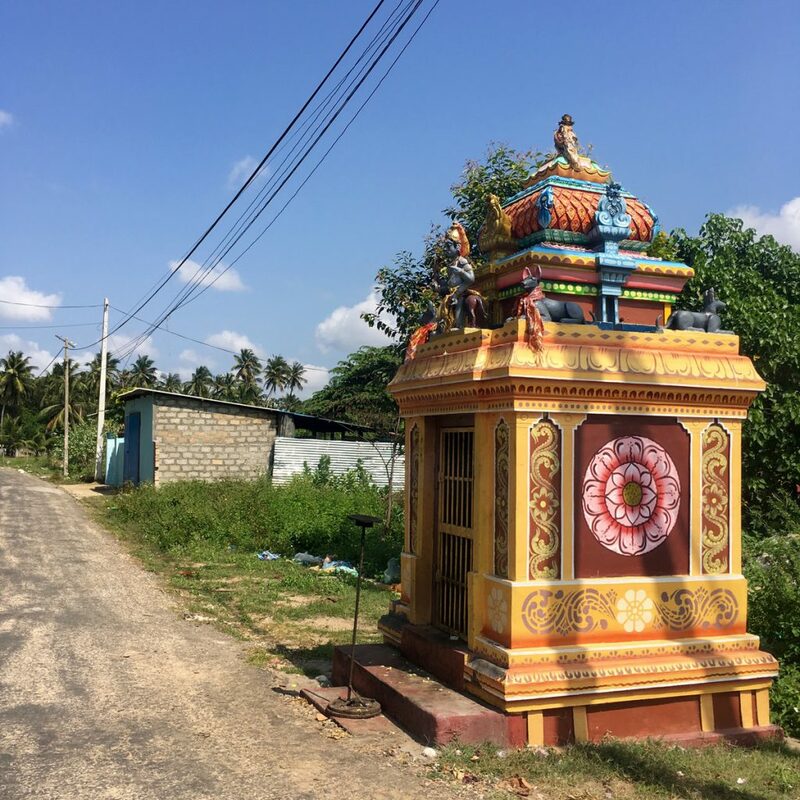 The Tamils’ cultural and socio-historical links to Tamil Nadu, on the other side of the strait on the Indian continent, are many, and include the practice of constructing fancifully decorated and colourful temples. 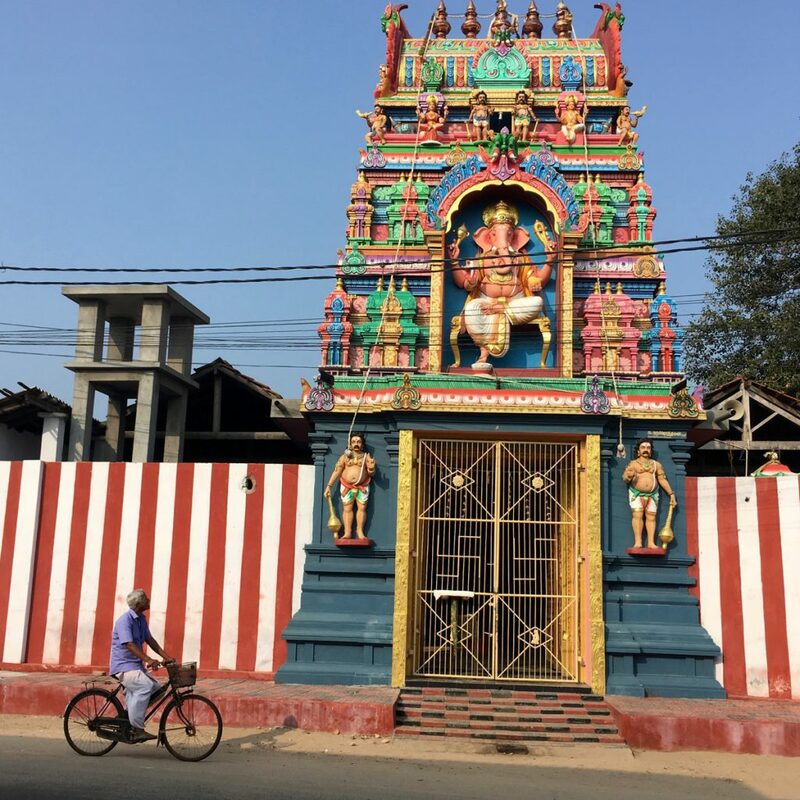 A man cycles past one of the temples in Nallur, a neighbourhood in Jaffna – once the capital of the old Jaffna kingdom – with several old and important temples. The most singifying feature of these temples, built in the Dravidian style that spreads across the Tamil areas in Sri Lanka and India, and neighbouring Indian states like Karnataka and Kerala, is their large and extraordinary decorated towers, or gopurams, which often can be seen from afar, rising high above palm trees and surrounding buildings. They are often painted in strong bright colours, or sometimes decorated in golden (like the main temple in Nallur) and from time to time kept natural (like the Maviddapuram temple, which for long was inside the army’s closed-off “high security zone” and got looted and destroyed during the civil war). Nallur’s Kandaswamy temple, the most famous Hindu temple in Sri Lanka, which has been destroyed and rebuilt several times. The current structure is the fourth one. 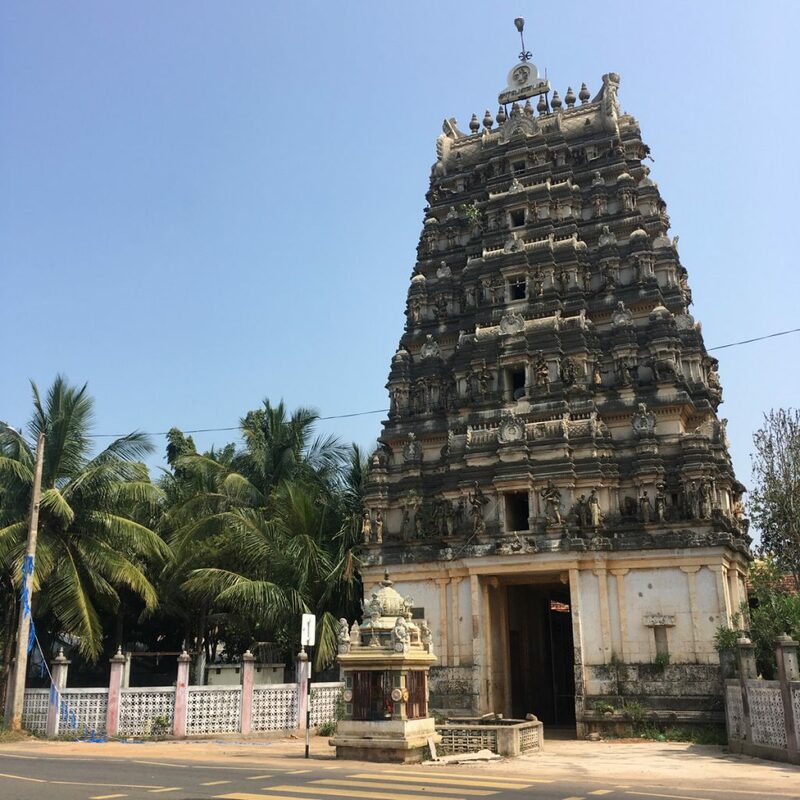 The temple in Maviddapuram, on the northern end of the Jaffna peninsula, which unlike most Hindu temples in Sri Lanka does not have a brightly coloured exterior. The sign on the top is the Tamil sign for the eternal sound “om”. 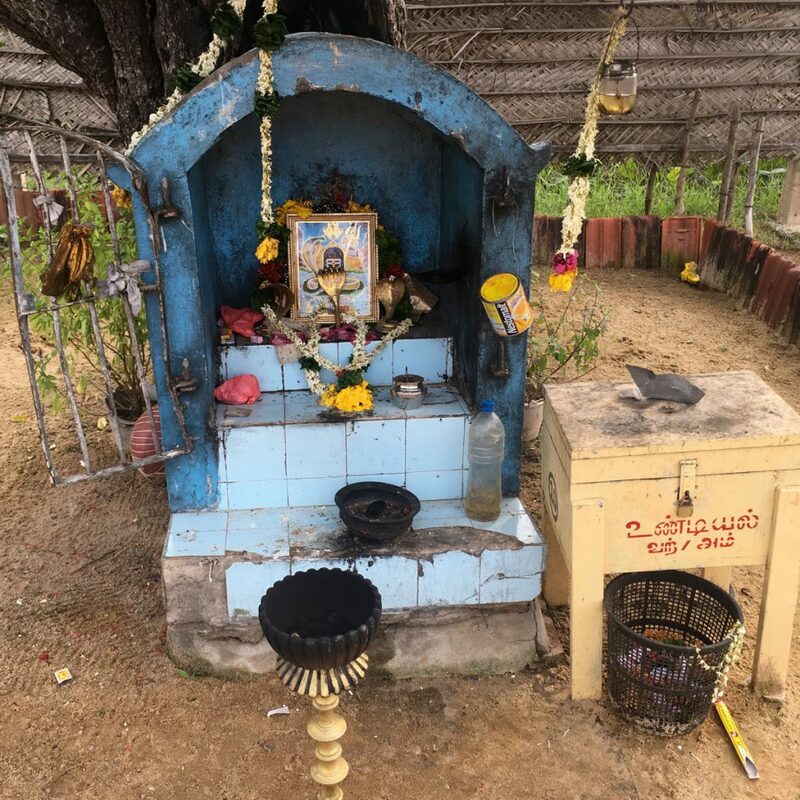 A small temple in Trincomalee, on a side street in the residential neighbourhood Orr’s Hill. An artist from Jaffna had just been there to paint the exterior, said the family living next door. 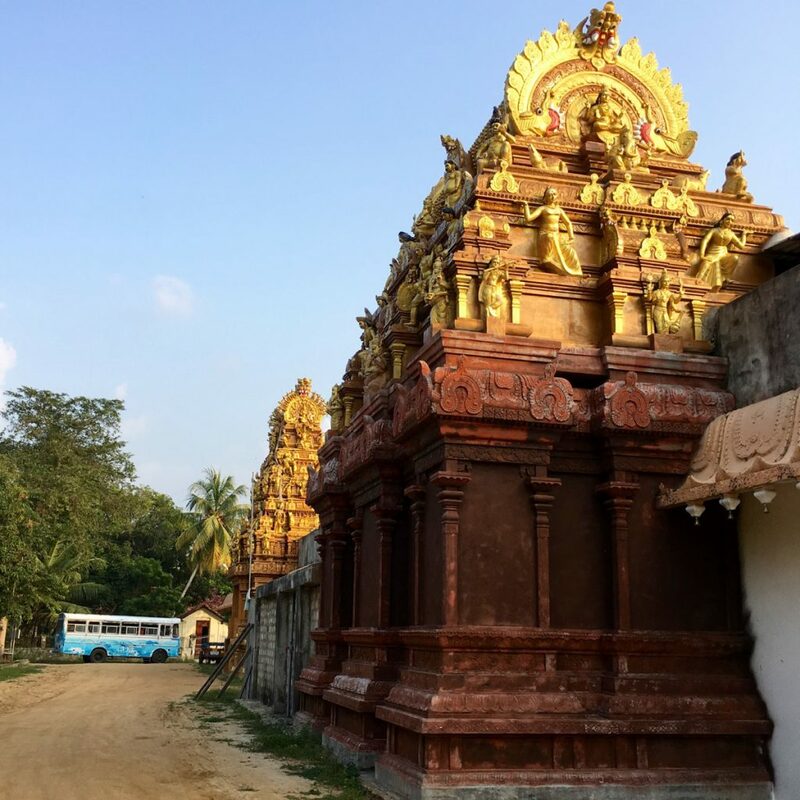 Another gold coloured temple, the Maruthady Pillayar Kovil in Manipay just north of Jaffna town. 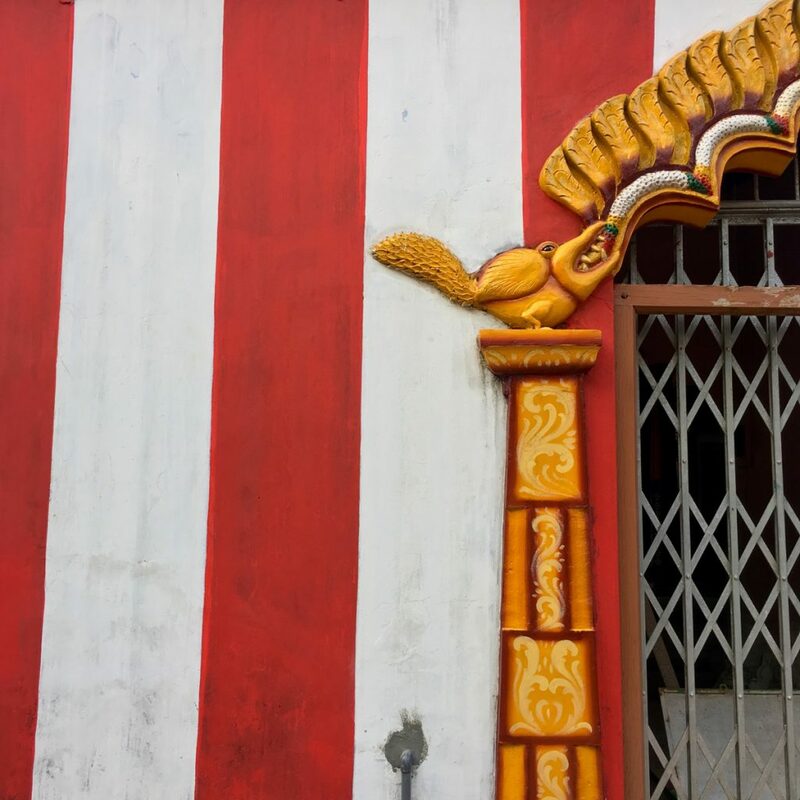 Apart from the colourful and decorated towers, many Tamil temples can also be spotted from far away because of their surrounding walls, unmistakably painted in red and white. I was a bit curious and wanted to know if the colours mean something special (you always want to check if there’s a story, right! ), so I asked a few who might know, including the all-mighty Google. It turns out many had no idea, or they would guess but were not sure. The Internet says things like “it is only fashion” or “Tamil lands have always been rich in red soil”, or advocate the idea that it represents the male and female, or perhaps blood and milk. In the end, it seems that (as very often is the case with things like this) there are many possible explanations but no one is really sure. For me, who is a true cowgirl at heart (in so far as my grandparents had cows – my grandfather loved them dearly, and would sometimes cry when sending a particularly dear one off to being killed – and I was born and raised in the region of Sweden which, at least when I was a kid, had more cows per capita than any other), the red and white of Sri Lanka’s temple walls always bring to mind nostalgic images of traditional Swedish farms, which are painted in the same colour scheme. In particular countryside temples like this one, surrounded by fields and greenery, remind of the red and white farms of rural Sweden. 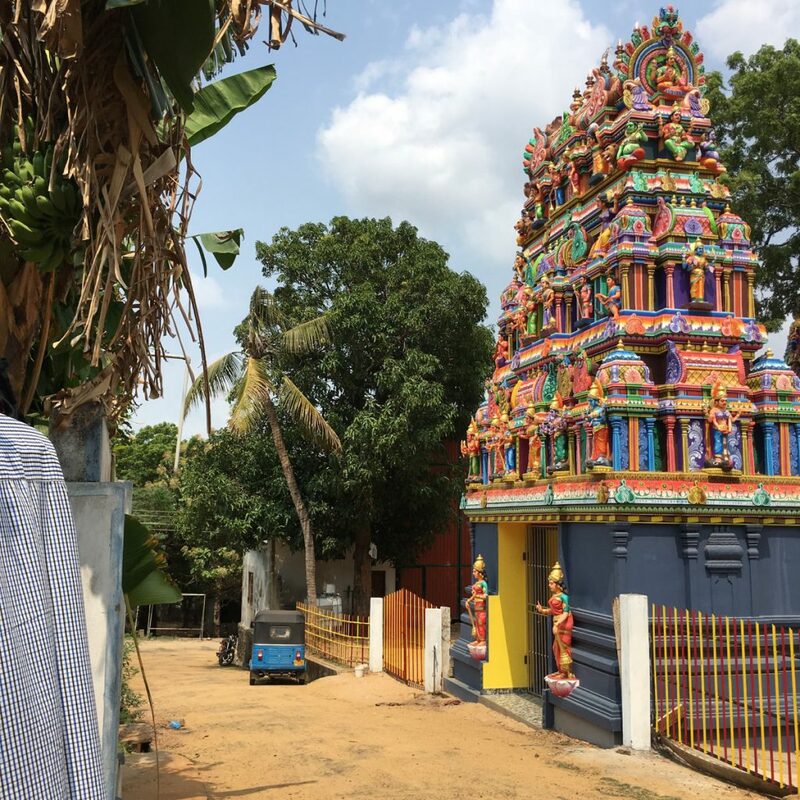 Interestingly, while temples in Jaffna, Kilinochchi, Mullaitivu, Trincomalee and other mainly Tamil parts of Sri Lanka are indistinguishably Hindu in their architecture, there are a couple of features which originate in the period of European colonialism. 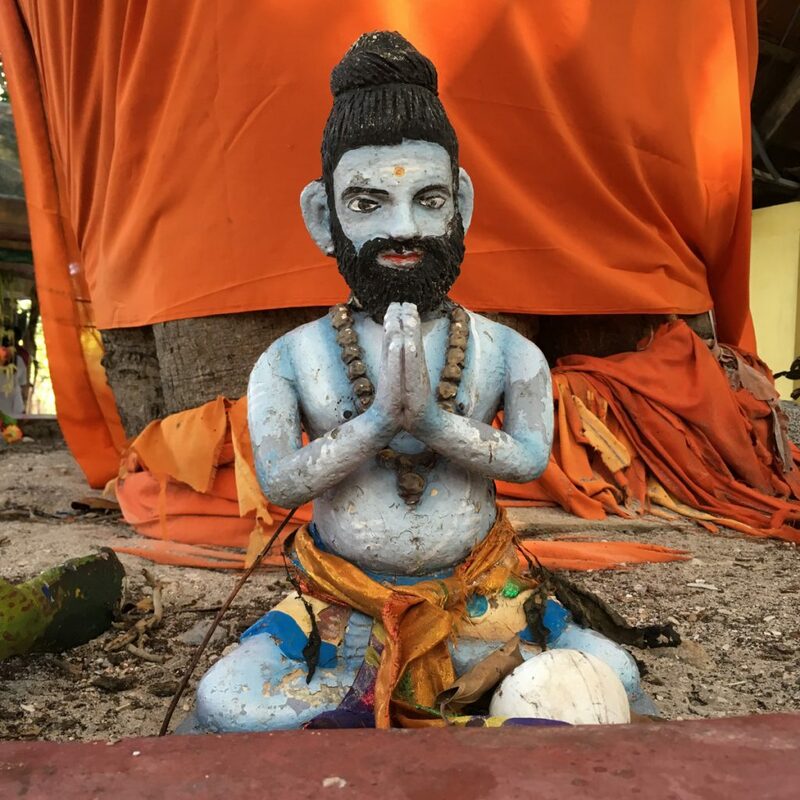 Hinduism, the earlier forms of which have been practiced on the island since several centuries BCE, was profoundly marginalised during this time, through violent and conversive means, particularly by the Portuguese. Many temples were destroyed, and not seldom were the crushed stones used to build colonial structures and fortifications. Many temples today are not in their original locations: churches were built there instead. Starting in 1560 with the Portuguese captain major and governor of Ceylon (the name of Sri Lanka at that time) Filipe de Oliveriya, over 500 Hindu temples were destroyed, including the Nallur Kandasamy temple in 1621 and the Koneswaram temple, on a cliff overlooking the sea in Trincomalee, in 1622. Many people were forced to convert: during the Portuguese to Catholicism and under the Dutch, who captured Jaffna in 1658, to Protestantism. 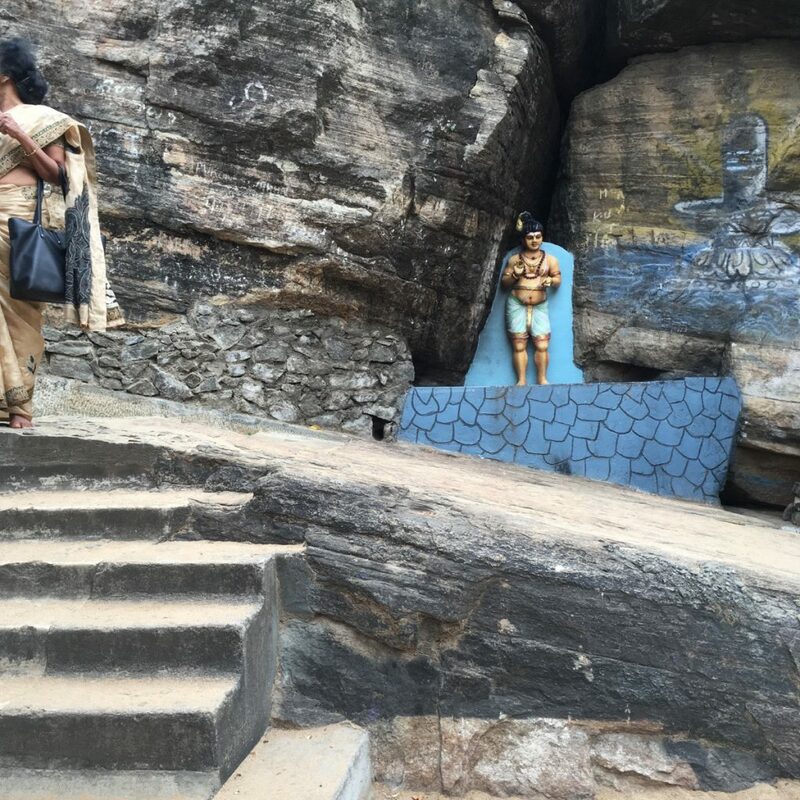 A statue inside a carved out cliff at the Koneswaram temple in Trincomalee. 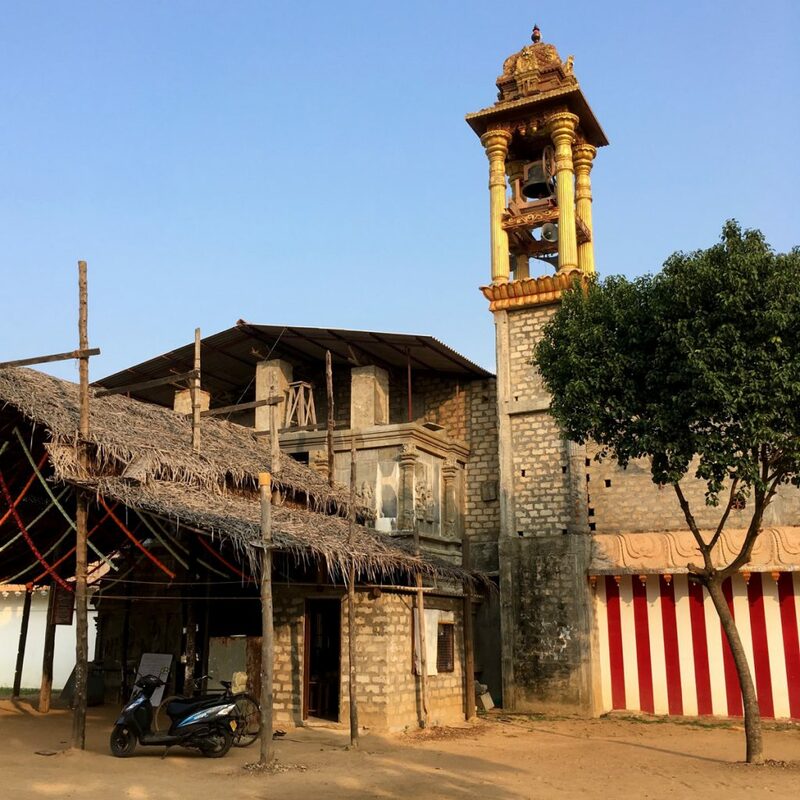 So what this resulted in – apart from the fact that many ancient and important buildings are no more – is that once the island’s Hindu temples were rebuilt, they came to borrow features from the new religious structures that had emerged across the island: Catholic and Protestant churches. 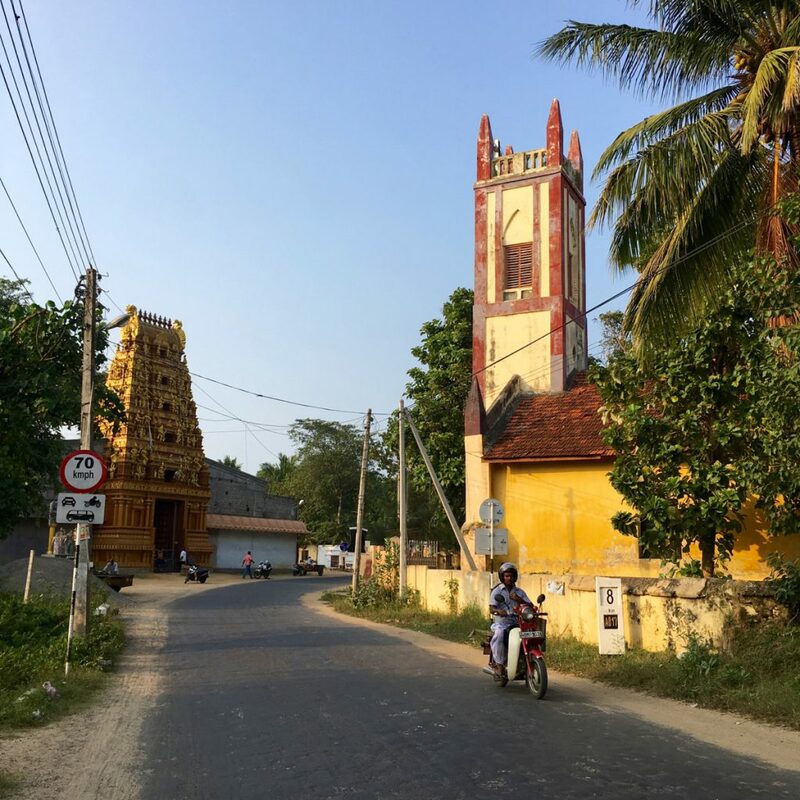 The most obvious result of this is the clocktowers – a feature unique to the Hindu architecture of Sri Lanka – which are part of almost all large Tamil temples now, but also architectural details like vaults and pillars resembling those in Christian churches. 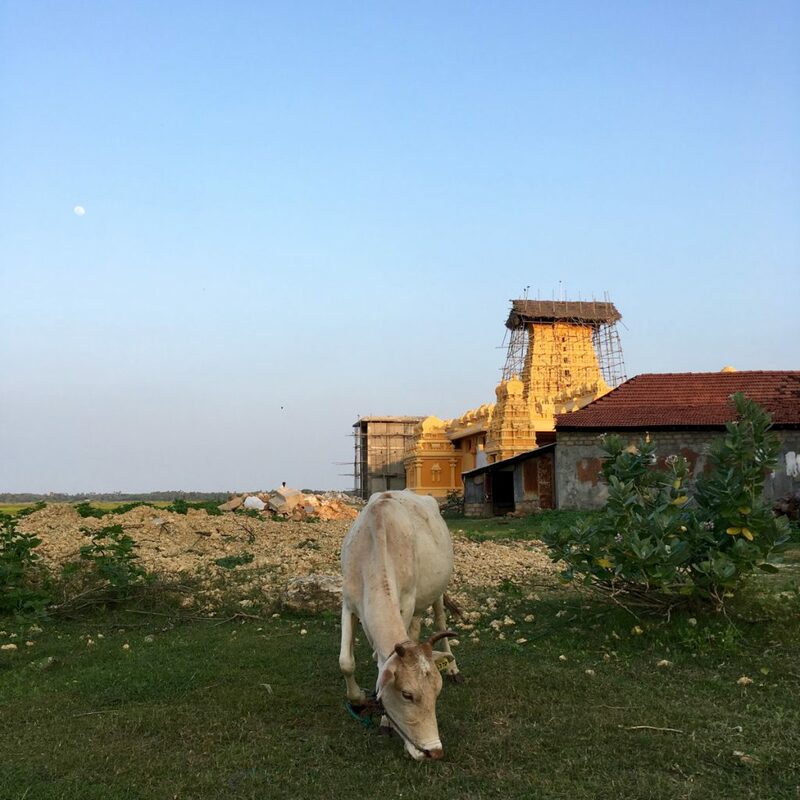 A clocktower next to the Hanuman temple near Chunnakam outside Jaffna. 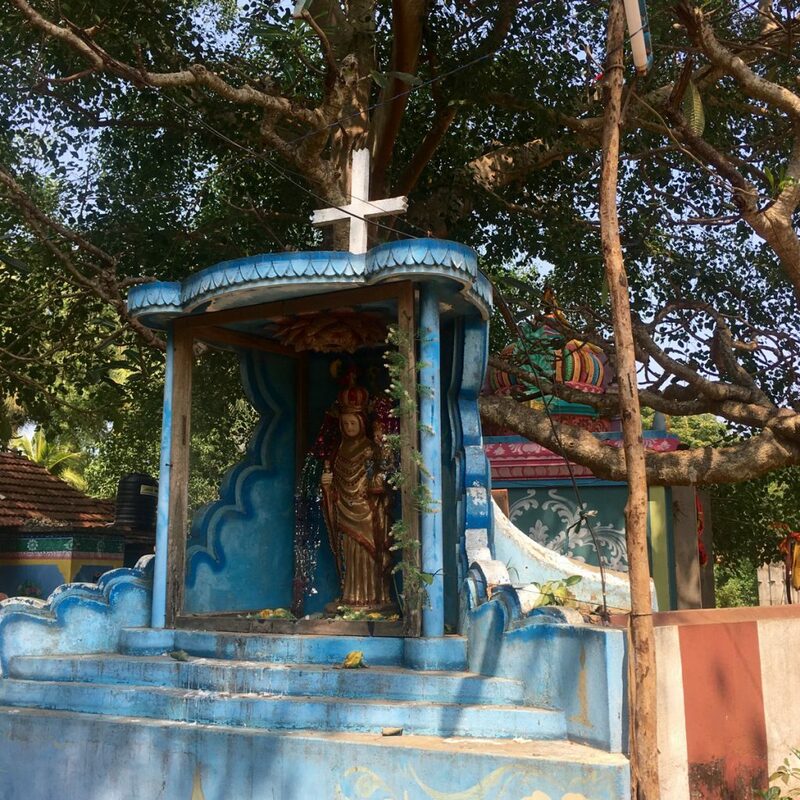 An interesting thing is that this religion-to-religion influence has gone the other way too: Christians in northern Sri Lanka have retained many of their pre-Christian traditions and cultural expressions (similarly to how this happened in India as well). 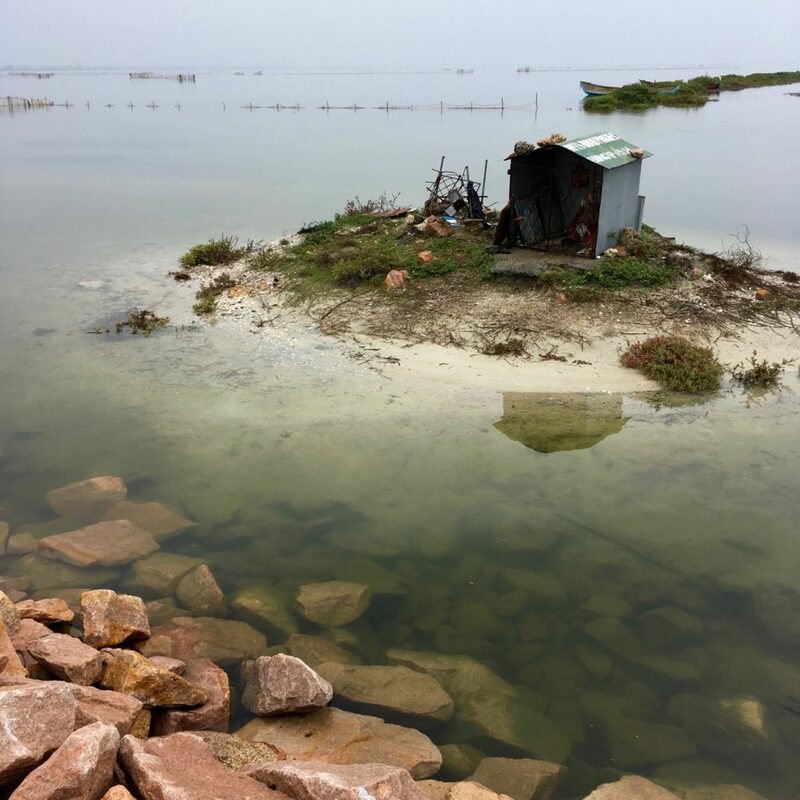 Much has been written on this and it merits a post of its own, so I won’t linger, but will only share this image from Gurunagar, a seaside neighbourhood in Jaffna populated by fishing families, almost all of them Christian. 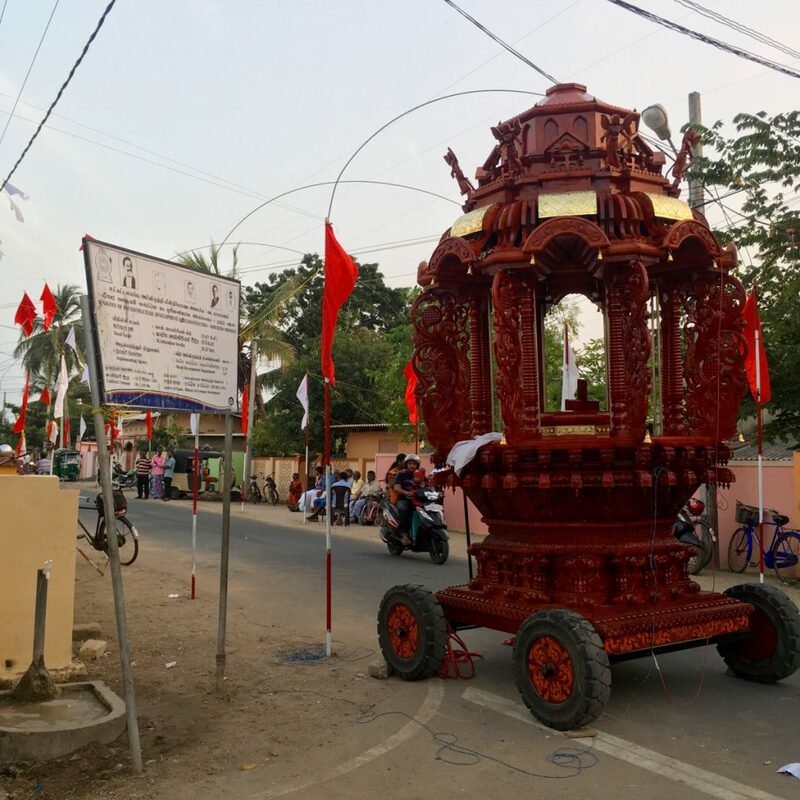 It shows a chariot, with carved out crosses and angels, parked outside church during mass – a curious thing because chariots have always been important and very prevalent objects in Hindu religious festivities. Indeed, European Christians when arriving at the subcontinent looked upon chariots as heretical. An interesting passage in a book on Christianity in India describes how colonialists saw the practice as “the epitome of all that was idolatrous and dangerous in Hinduism”, and even created an entirely new word in the English language: juggernaut, meaning an immense and unstoppable threatening projectile or entity, taken from the Hindu lord of the universe, Jaganath, who at the temple in Puri in eastern India has a large chariot festival celebrated in his honour. Today, Tamil Christians and Hindus in Sri Lanka have an overall good and oftentimes close relationship – marriages across these religious lines are common (“we have the same language, that is more important”, is something I have heard more than once) and the communities often live in mixed neighbourhoods or nearby each other. 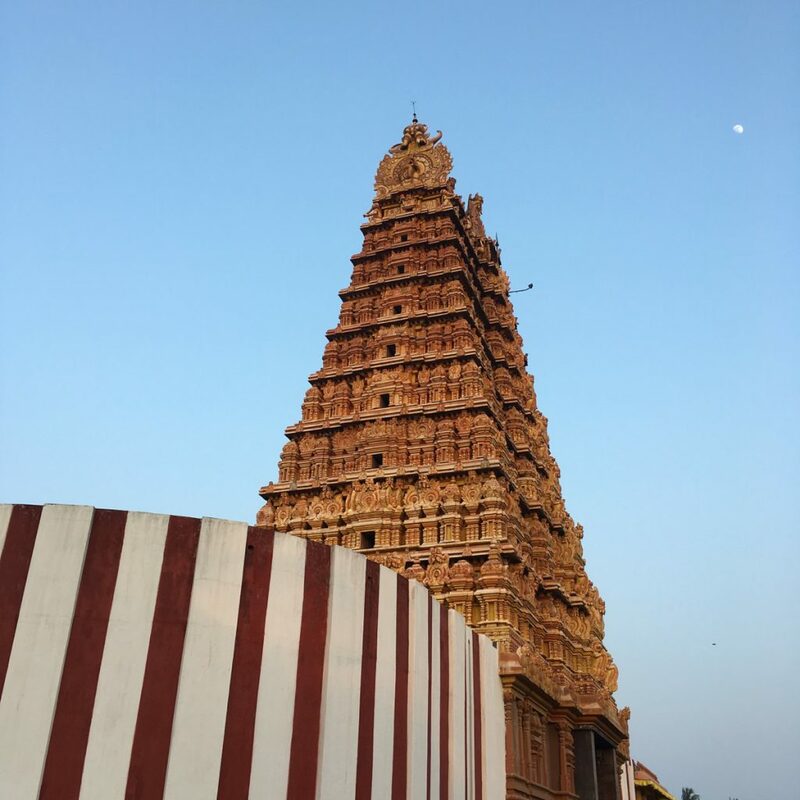 Speaking of language – the word “kovil” in Tamil refers to both temples and churches. The Maruthady Pillayar temple in Manipay, with a church on the opposite side of the road. 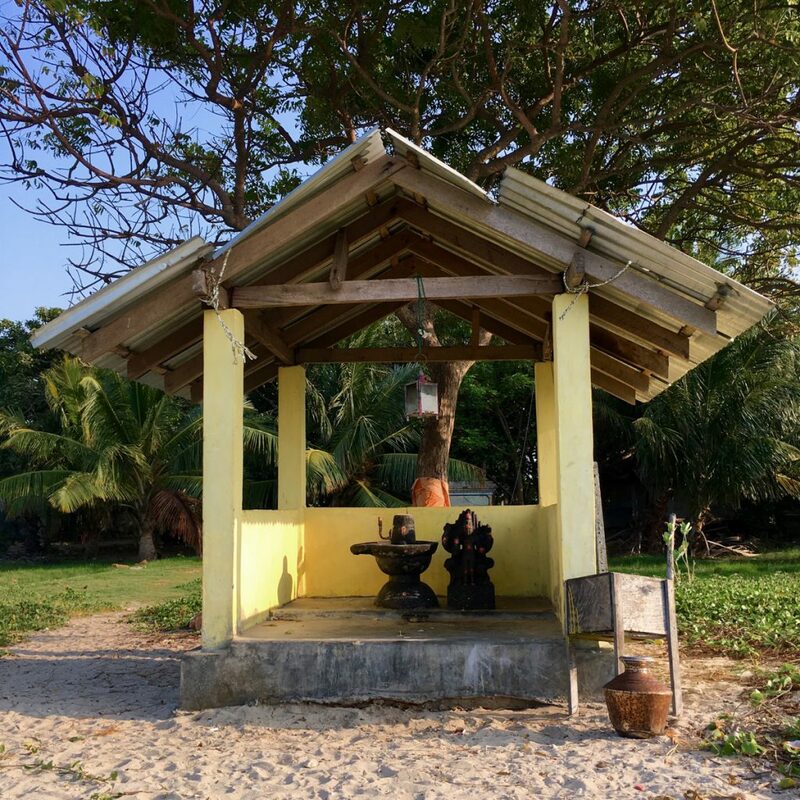 A small Christian shrine built right outside a Hindu temple on the outskirts of Jaffna. 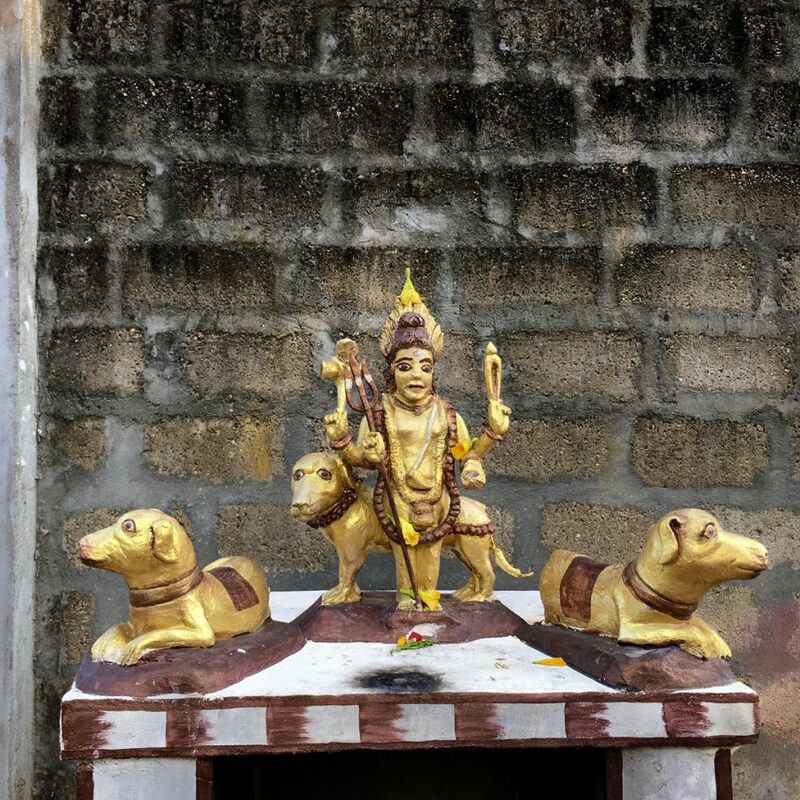 Roadside shrines, as mentioned at the beginning, are countless and come in so many forms. So this here is just a very tiny compilation, and in no way representative. Still, it gives a small window into the many different styles and aesthetic expressions of these small temples. Temples and sites of worship, whatever religious expressions they may take, are in the end so much more than religious places. They are intimately spiritual at times, and outwardly communal at others. I think sometimes about my grandparents from rural Sweden, who went to church from time to time but never expressed any particularly spiritual or scripturally Christian outlooks on life. They were social people both grandma and grandpa, and I am sure they went to church because it was a place where they would meet their friends. Church activities at their time, in countryside south-central Sweden, were very much an occasion for people to take a break from the demanding work in the fields and just spend time together. 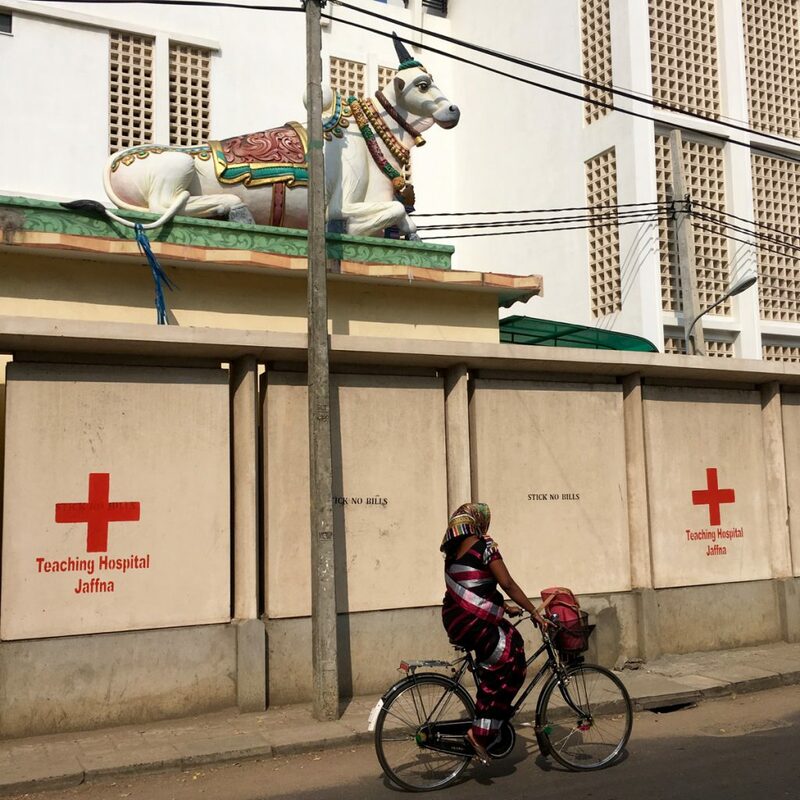 The other day, I biked past a temple in Jaffna; it was decorated and filled with people, celebrating pilgrims on their way to pilgrimage in Kerala in southern India. Groups of seated families occupied every bit of space inside the temple, and there were small activities going on all around. Children found other children, started improvised games and ran around, caught in that magical moment when everyone is in a celebratory mood and you as a kid are freed, for a moment, from all restrictive musts/must-nots that dictate things in the normal, everyday life. For a second, I was brought back to similar events during my childhood, which reminded me that when it comes to being human, it is only form, never essence, that makes us different. At the entrance of a temple in Jaffna: powder and coloured paste for making the spiritual marking on the forehead. 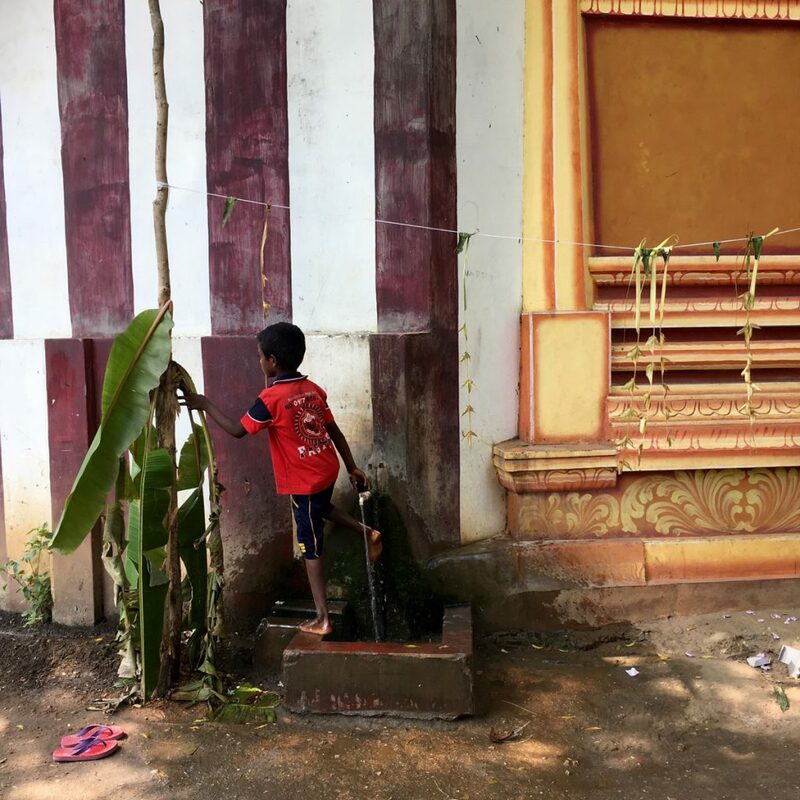 Next to the entrance of another temple in the city: water to wash your feet before entering the gates. 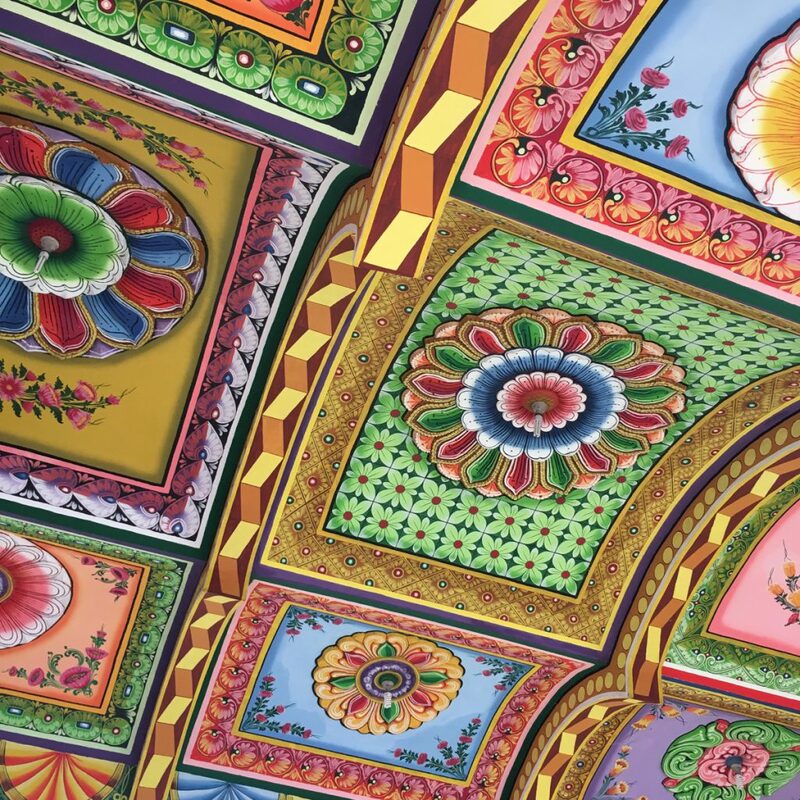 The inside ceiling of a temple in Batticaloa, on Sri Lanka’s east coast. Some temples have decorations that seem hastily painted, with rough and faded edges; others, like this one, are beautiful and extremely detailed. The same temple, from the outside. Many of northern Sri Lanka’s temples have been reconstructed after the civil war ended, and not least for those communities who escaped the conflict and now live abroad, rebuilding temples has become a symbolically (and, no doubt, emotionally too) important act of demonstrating that they still wish to retain links with the country they were forced to leave. In many places therefore, new and renovated places of worship may be surrounded by emptied and destroyed houses, whose residents have not been able or cannot afford to return and rebuild. A temple under renovation in Araly outside Jaffna. The temple inside Jaffna’s main hospital, which was the site of a brutal attack during the civil war. 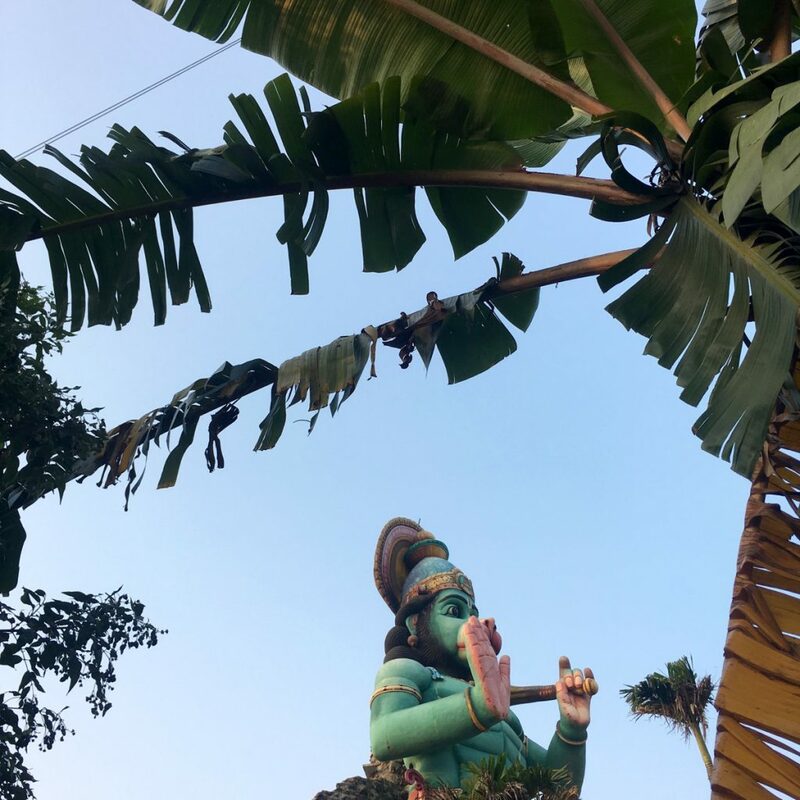 Finally, a larger-than-life statue of lord Hanuman keeping a watchful eye over people traveling on the always crowded KKS road, connecting Jaffna city to the northern shores of the peninsula. Hanuman embodies courage and strength (and legend says he was involved in the very creation of Sri Lanka, when he did a giant leap from one side of India and landed on the island), so what better guardian to stand aside a busy road?